When I was young I didn't like rice soup at all. I just learnt to like/appreciate it in my late 20s. Now, I find "Kao Dtom" very comforting... I guess it has something to do with me not living with my parent any more (aka "homesick"). Rice soup always reminds me of my mum... she always cooked it for me when I was ill. Anyway, "Kao Dtom" is delicious.. its warm (as warm and as warm-hearted) and light yet filling. 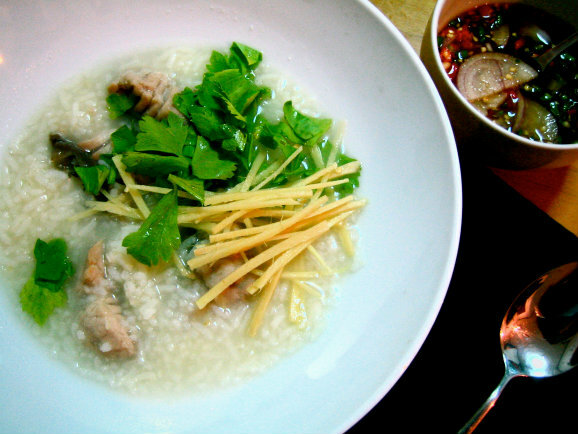 Its not only good for breakfast (Thai people usually have rice soup for breakfast.) but its aslo very good for light dinner. At times, you feel so stuffed and you dont want any heavy dinner but if you dont eat then you will probably get very hungry later at late night. Rice soup with seabass seems to be the perfect choice. Set a large pot over medium heat, add stock and later add rice. Cook the rice till almost cooked through, keep stirring. Season with sea salt, crushed ginger, crushed coriander roots, and crushed garlic. Bring the soup back the the boil. Add seabass and grated galangal, leave till the seabass is cooked through (at this stage - DO NOT STIR, otherwise the soup will be very fishy and you will break the seabass into small bits. You don't need small bits of fish in the soup as it doesn't look nice in term of presentation. Believe me, everyone wants the seabass in nice chunks in their rice soup!). Taste if more seasoning is needed. Turn of the heat. Sauce : Put everything into a mixing bowl, add all ingredients, mix everything till combined well. Taste if more seasoning is needed. It should taste tangy (with lime juice) and salty, with very little of sweetness and with a touch of spiciness. Plating : In serving bowls, spoon the rice soup and some seabass chunks in. Sprinkle with julienned ginger, chopped Chinese celery and garlic oil (to taste - I don't normally drizzle the garlic oil on my rice soup as I like it simple and clean. I always serve the garlic oil separately.). Sprinkle lightly (or heavily) with ground white pepper. Serve hot with a small cup of soy bean paste sauce. Delightful! Yummy! We love sea bass and we actually have many fish farms growing sea basses here in Greece. Thanx for giving us another way to cook them! Cooking is my "True Love". I feel very calm, relaxed, & happy being in my kitchen. My food is mostly Thai, home-cooked, clean, simple & very simply-presented with a pinch of style. To me, to cook something good & tasty, high-quality & fresh ingredients are very essential. (I always choose the best quality ingredients that I could afford.) Hope you like my recipes!